Nick and Graham start off the show talking about what general types of photography they each are attracted to. They then launch into a discussion of shutters and what kinds of shutter speeds are really needed and do we need very fast and very slow shutter speeds (19:08). They talk a bit about what techniques could be used for very fast shutter speeds (34:00) and then why Graham doesn’t necessarily want a perfectly round aperture for a pinhole camera (38:05). They talk a bit about Amos Dudley’s blog about shutters and other things related to building a camera from scratch: http://amosdudley.com/weblog/SLO-Camera (48:45). Nick talks about why he wants to get a bunch of broken and worthless SLR cadavers and other cameras in his pursuit of learning their anatomy, just like a medical student does with feet (1:04:45). There were a few audio issues with this episode. Please bear with us through the pops, scratches and bangs. The boys start off with a discussion of the ins and outs of leaving cameras in your car during hot weather (00:00) and Nick explains why he wants a camera like a bar of soap (13:00). They continue the discussion of the travel camera they started in the last episode (14:40). Graham can’t remember the name of the Olympus Trip 35 and felt like a fool for forgetting (23:50). He then redeems himself with a reconfiguring of the body of a travel 35mm camera on the model of the film cartridge backs of medium format cameras (28:20). Graham talks about Graham (another one, better known as Chickenthumbs on Instagram) 41:45. Graham blathers on and on about his Flex-O-Pan at 58:00 so you’ll probably want to skip head to the good stuff, like the next episode of Photography Matters with Ted Viera. 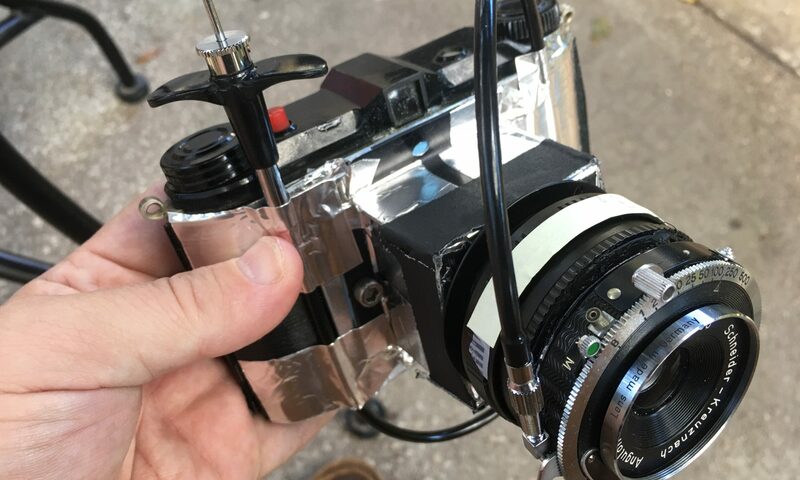 The talk turns to a Kickstarter campaign to create a digital sensor that drops into a standard 35mm camera and how that could be the source of sensors for digital camera builds (https://www.kickstarter.com/projects/1374923168/film-35-innovative-photography-experience) (1:29:00). Nick sends a shout out to Ralph Lundval (1:53:20) and the images he posted using an enlarger lens and a Speed Graphic. After covering the subject of whether a person should dress in layers while hiking in the Pacific Northwest, Nick and Graham talk about what kind of features they want in a camera for travel (8:00). Nick describes his Duffer Suit and how it allows him to be ignored when he takes pictures (21:20). Graham describes the psychological reason why Leicas kept the bottom-loading system for as long as they did (24:00). We get a bit of a non-update on the Scamera project and what the guys worked on the past two weeks (30:45).